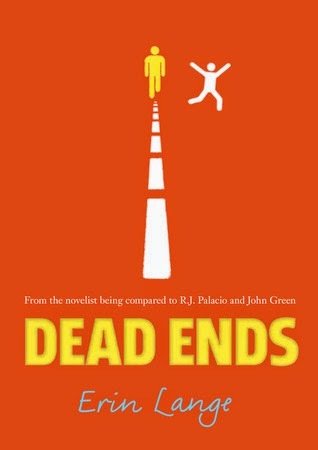 After having read the brilliant Butter, I couldn’t wait to read the author’s next book, Dead Ends by Erin Lange. Dead Ends follows Dane, a teenager who’s not afraid to use his fists when he feels the itch. Most wouldn’t want to cross him, so of course Dane is surprised and put out when, Billy D, the new kid with Down Syndrome, is not scared of Dane in the least. Dane is one step away from expulsion and Billy D has some thugs out to get him, so the pair make a deal (grudgingly on Dane’s part) to help each other out. In the process, the two find out that they have a lot in common and that the other isn’t as bad as they first thought. I enjoyed Dead Ends mostly because of the characters. They were very realistic and going through problems which readers can relate to. Dane is poor. All he wants is a car so he can drive himself places, but his mother, who has really good luck when it comes to the lottery, never cashes in her tickets, but rather puts them on display. This is one of the factors that leads to Dane’s bitterness which sometimes shows in the story through his violence. After Dane promises to help Billy D find his father, they set out to solve the clues in the atlas Billy D’s father gave to him. I felt really sorry for Billy D because all he wanted was to find his father. His frustration is evident through the pages of the book. However, all things considered, this book fell short for me as I found it anti-climactic. There were no big surprises and I didn’t feel like I really related to any of the characters or supported their motives. While I didn’t like it as much as Butter, it was a good story.